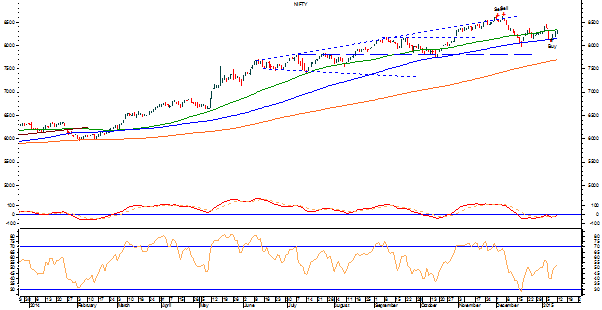 Markets remained volatile and at the same time continued with its up move and ended yet another day with modest gains. The Markets saw negative opening and post opening on negative note, formed its intraday low of 8245.60 in the early minutes of the trade. The morning trade saw the Markets recovering from the opening lows and trading flat with a capped range. The Markets once again saw a dip in the afternoon and went very near to its day’s low. However, the second half of the session saw good pullback from lower levels. The Markets not only recouped all of its losses again but also went on to trade higher in positive territory. It went on to form the day’s high of 8332.60 and while maintaining these levels, ended the day at 8323, posting a net gain of 38.50 points or 0.46% while continuing to form higher top and higher bottom on the Daily Bar Charts. Markets have continued to pullback but have resisted to its 50-DMA level which is 8338. Technically speaking, the Markets are expectedly to give a flat to modestly positive opening and continue with its pullback. It would be necessary for the Markets to move past this 50-DMA levels in order to continue with its up move. Favourable technical indicators supported by better than expected CPI and IIP data will aid to this. The levels of 8340 and 8395 would act as immediate resistance. The supports come in at 8245 and 8210 levels. The RSI—Relative Strength Index on the Daily Chart is 53.0424 and it remains neutral as it shows no negative divergences or bullish or bearish divergence. The Daily MACD is bullish as it trades above its signal line. On the derivative front, the NIFTY January futures have added over 4.42 lakh shares or 2.59% in Open Interest. This is significant as the Markets were rising while shedding its OI. It was necessary for the Markets to add OI while on the rise as it implies that the rise is not merely due to short covering but is aided by fresh long positions. Returning to pattern analysis, the Markets are still in the process of continuing and confirming its pullback. After retracing sharply from its lifetime highs, the Markets took support twice on its 100-DMA at Close levels and while pulling, it has ended very near to its 50-DMA. It would be imperative for the Markets to move past this level and stays above there in order to continue with its pullback. Overall, the technical indicators as supported by F&O data stand in favour of the Markets continuing with its pullback. However, lack of volumes, which was evident in previous session, may cause it to consolidate in a given range for some time. However, IIP which stood much better than expected and the CPI coming at notch below expectation will certainly add cheer to the favourable technical indicators. Overall, positive caution is advised for the day.